Back when nuclear researchers were learning how to capture and utilize the newly discovered source of energy developed for the first atomic bombs after World War II, there was a much (but unpublished) consternation among scientists over the use of thorium instead of plutonium for use in early energy breeder reactors. They recognized even then that there was extreme danger in working with uranium, the by-product of plutonium used in the manufacture of nuclear energy. But Glenn Seaborg, the man who discovered plutonium, revealed to the Atomic Energy Commission as early as 1968 that a thorium-based reactor had been successfully developed and tested, and would be a much safer way to go in building commercial power plants. Seaborg and his colleagues argued that a thorium fuel cycle offered superior physical and saver nuclear fuel properties, reduced nuclear waste and that thorium was found in much greater abundance on Earth. 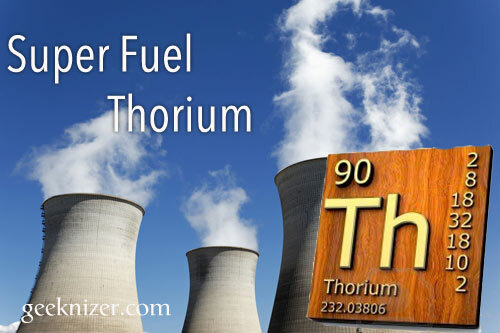 The problems: the development of thorium power was much more expensive and . . . you couldn't use it to make bombs. Research on thorium nuclear energy went on at Oak Ridge National Laboratory and the process was proven. But in 1973, while Richard Nixon was in office, the U.S. government shut down all thorium related nuclear research. The reasoning was that Uranium breeder reactors were more efficient, the research was proven and the byproducts could be used to make nuclear weapons. Since then nuclear power plants have appeared all over the world. Some like the disasters at Fukushima, Chernobyl and Three Mile Island have made shocking headlines, and all of the operating plants have been spewing radioactive clouds of isotopes into the atmosphere on a daily basis since they began operating. We didn't just built nuclear electric generating plants. We put nuclear reactors in submarines so they could remain at sea and underwater for months without coming to the surface. We put them in naval vessels. Medical institutions found ways of utilizing radioactive tools to help study and heal the human body. Now with the Fukushima plants in total meltdown and no known way to stop what is happening there, some scientists worry that the entire Northern Hemisphere of the world is being affected by radioactive waste that is in the seas and the air. It is affecting the animals, the human population and the food we eat. That single disaster, caused by short sided developers who chose to build a row of nuclear generating plants on top of a known fault line, and the violent earthquake and tsunami that eventually destroyed them, is now threatening the entire world as we know it. Could all of this have been avoided? You bet it could have if military strategists had not forced the nation's hand in the early days of developing nuclear energy. Back in the 1960's and 70's when thorium reactors were under serious consideration, Oak Ridge director Alvin Weinberg lost his job because he disagreed with higher powers over the development of plutonium based energy systems. Weinberg fought the sacrifice of potentially safe nuclear power for the benefit of military uses. He fought hard for making thorium the heart of the nation's atomic power system and because of it, he was forced out in 1973. Now that it may be too late to stop an ongoing disaster in Japan, and with potential melt-downs and toxic discharges occurring in aging nuke plants all over the world, researchers are again considering thorium-based power systems. Nuclear scientist Ralph W. Moir and Edward Teller at Georgia Institute of Technology are suggesting that thorium nuclear research should be restarted and that a small prototype plant should be built. Indeed, liquid fluoride thorium reactors are already being studied and planned in India, China, Norway, Israel and Russia. And while this is going on, world leaders are in a quandary over what to do about giant arsenals of atomic bombs now stockpiled at military facilities all over the world. The worry is that any attempt to use this weaponry in warfare has the potential of destroying all life on the planet overnight. To make this story even more scary, newly elected President Donald Trump is already advocating advanced development of the nation's nuclear stockpile of weapons as part of his plan to pour even more U.S. tax dollars into the military.